Yesterday was a slow day in my bedroom re-do. I am hoping that today will be a lot more productive. But in the meantime, the little bedroom set up in my living room is looking beachy keen. 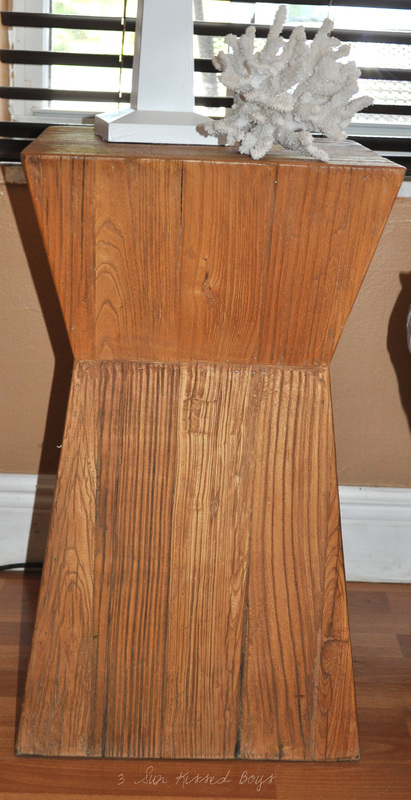 An accent side table serves as a nightstand giving the bedroom a rustic beachy look. The older I get, the more I love decorating with items that have special meaning. 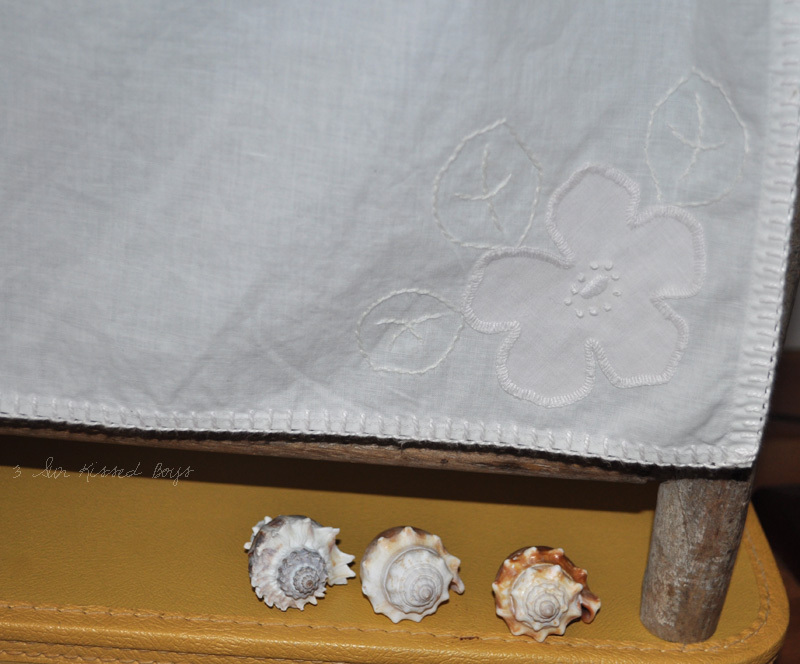 The white embroidered place mat belonged to my husband's grandmother. The shells, the Sun Kissed Boys and I collected in our vacation last year in Naples. 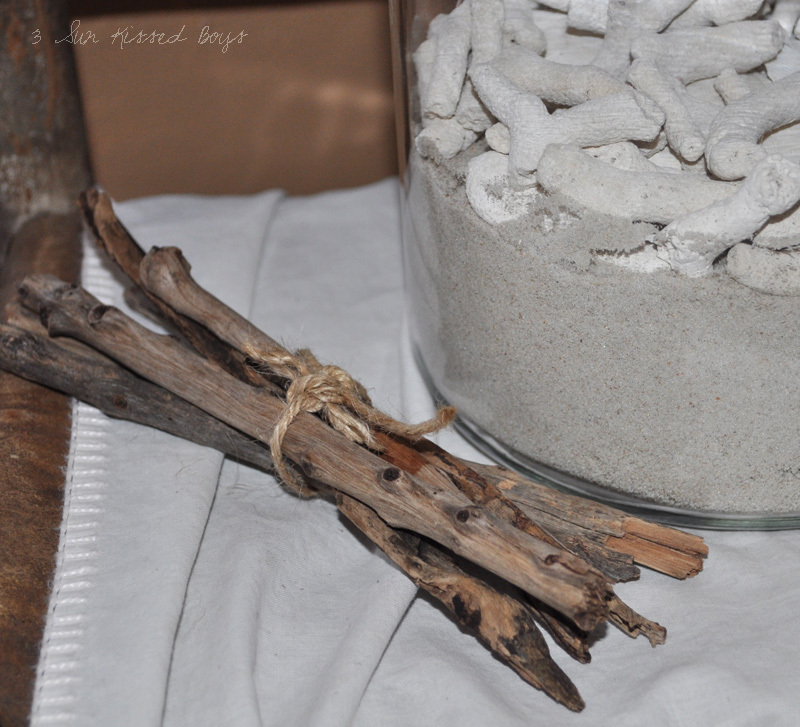 Organic items help bring the outdoors in. My mom and I collected these sticks on our last beach outing. The sand, I brought back with me from a trip to Daytona Beach. These shells came from Mexico, from our honeymoon, almost 17 years ago. 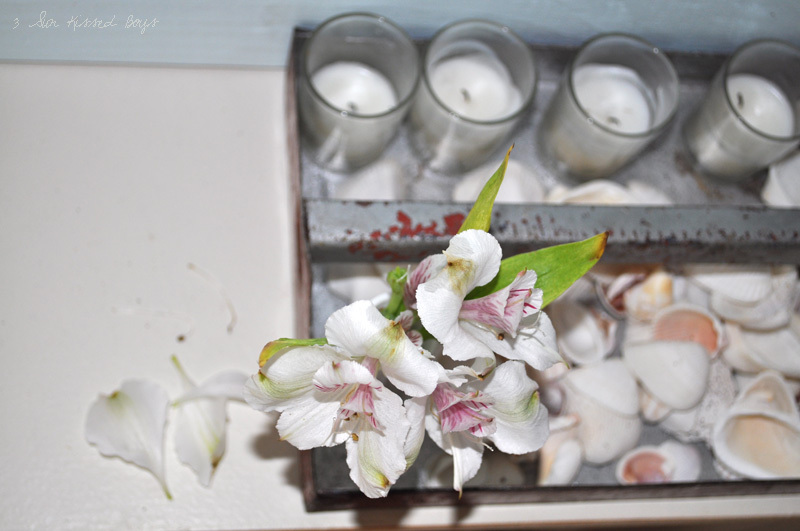 They are displayed with candles and flowers in a tool caddy. Layering pillows make the bed comfy, inviting, and scrumptious. As I was moving furniture around, this little guy was hoping to blend into the decor. Tomorrow is the last day of school in our parts and I was hoping to be finished with the master bedroom but it's not looking too promising. What about you? Do you give yourself decorating deadlines? Do they work? I give myself starting deadlines and ending deadlines and stick to neither of them. That's why things don't get done around here as much I would like. Love the red tool caddy and what you've got in there; very cool! i love this look! the coralis so fresh, warm, and beachy! Love this one!! 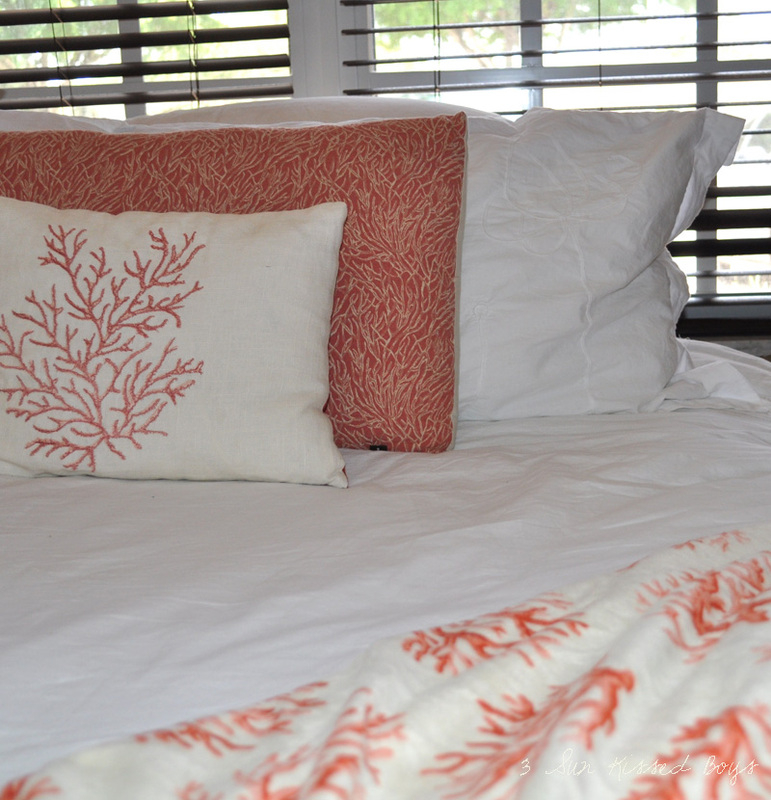 I love the corals and your pillows and throw are so beautiful. 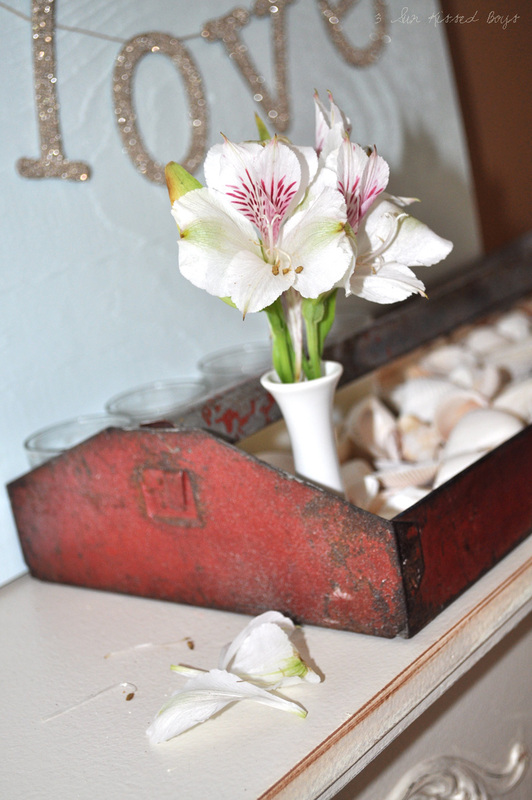 I think that surrounding ourselves with items that have special meaning is what makes a house a home. Your treasures are perfect and I am so glad that they bring you joy. I can't believe that school is almost done here too, Friday is there last day! Enjoy!! I love the sentimental touches, Yanet! The bench at the end of the bed is really cool, too. I do give myself deadlines, and unless it's something I'm doing for someone else, they don't work. Like the float I'm building~it HAS to be done by July 4th, so that's one deadline I'll meet. i love this look and the first one you posted the best! I am so ecstatic to see your master bedroom reveal! I am thinking about switching things up in my rented house and need some inspiration! As always, Cooper looks adorable. Have you been able to keep his beard clean as you intended? I am going to be "copying" your Kiss Deeply sign this weekend. I keep thinking of the best place to put it and I can't decide. when I finish it I will send pics! I always give myself deadlines and then real life gets in the way. School ends next week here, but this week, it's half days. I'm coveting that tool caddy. Love the coral pillows. They look so pretty!! Looking forward to seeing it when everything is all done. hang in there! Love the touches of coral! I've been on a coral kick lately too! Visiting from the CSI Project! My deadlines are a moving target! LOL. They never work! 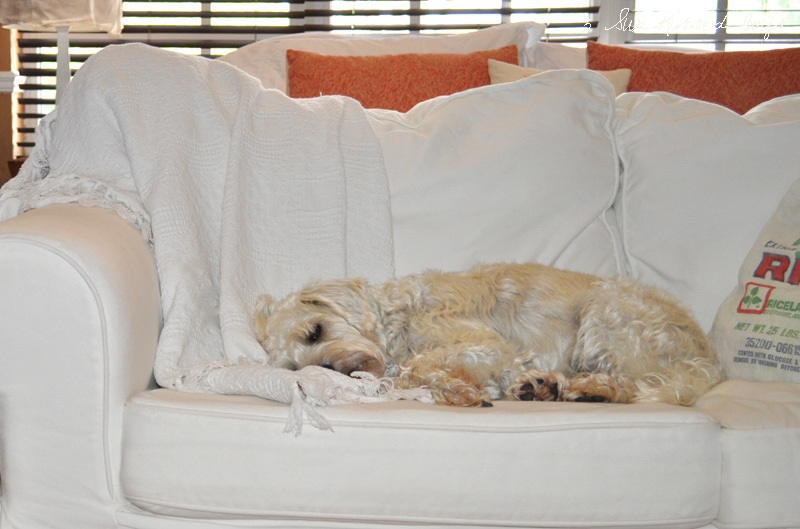 Love your coral bedding... and I always love a post with a puppy. So cute! Congratulations on your CSI win! Your room is just beautiful. Love the shoe bucket. 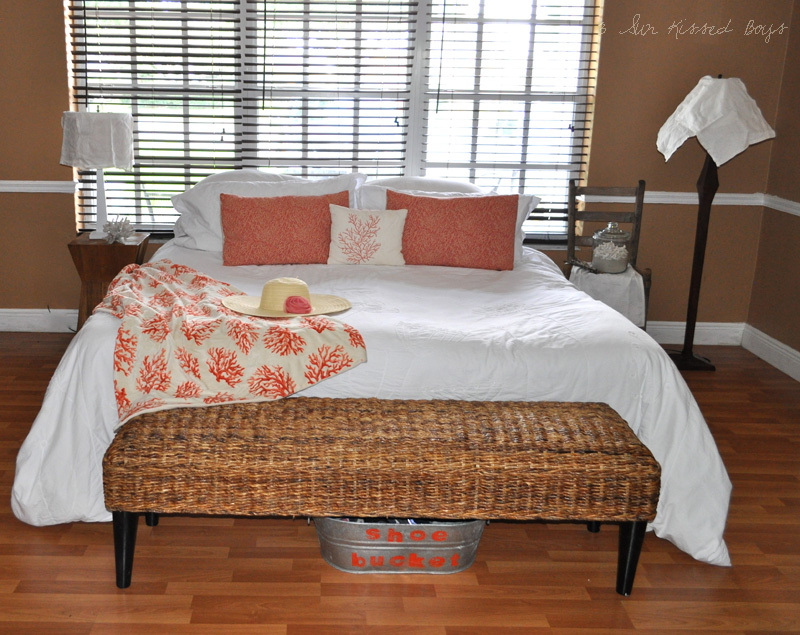 I just love this room I think the coral bedding is my favorite---it just draws me right in! Yayyyy for being featured over at CSI!!!! :o) Beautiful! Congratulations on your CSI award. Your room is beautiful and your little dog is really cute too. He looks like he's trying to blend in so he doesn't get kicked off the furniture. Gorgeous bedroom - I linked it to my master bedrooms post too today, well done!